Other Geneabloggers have been writing about their memories of this historic "where were you when..." event and I thought I should put my memories in writing. On the beautiful late summer/early fall clear blue sky morning of September 11, 2001, I had sent my 2nd grader to school and had my Kindergartner at home because he attended afternoon Kindergarten and didn't have to be there until noon. When my kids were young and were home with me, I never watched TV and rarely listened to the radio. Around 9 a.m., I made a phone call to another parent to discuss a parent committee we were co-chairing and she told me that a plane had hit the World Trade Center in New York and I should turn on the television. I believe I turned on the TV just after the second plane had hit. When my 5-year-old came into the room to ask why I had the TV on, I turned it off because I didn't think at his age that he needed to know what was going on, and frankly, I didn't really know what was going on yet and wasn't sure how to explain it to him. In Massachusetts it was a State Primary Election Day, and because our usual polling place, the local elementary school, was closed for renovations (the boys were bused to another building across town for that school year), I went to the public library to vote. It was the only time I can remember hearing a radio on in the library as I walked through to get to the room where I got to vote. The schools decided that it was best for the students to remain at school on as normal a schedule as possible, so my Kindergartner hopped on the mid-day Kindergarten bus at 11:30 a.m. or so. Soon after, my husband came home from his job at TJX Companies after a unique all-employee meeting where the company CEO confirmed for the employees that yes, seven of their co-workers had been on American Airlines Flight 11. He then allowed employees to go home. We watched TV together to see what was going on. I was stunned and sad and couldn't understand who would do such a thing. Because the boys were quite young, I always met the school bus and that particular day, I met the school bus and gave each of my sons an especially big hug. Because we live in a suburb of Boston, we were used to sometimes hearing airplanes on their way to or from Boston's Logan Airport. I do remember thinking that it was very strange to hear only the occasional Air Force jet fly overhead for several days. I watched some of the television coverage, but found it very difficult because I would get teary (or worse) every time I thought about the loss of human life. Over the next several days, my husband watched as much of the television coverage as he could, and we tried our best to explain what had happened to our young sons. 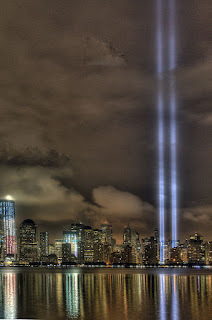 A view of the World Trade Center 9-11-11 Tribute in Light from Jersey City, NJ. It took me awhile to realize that it actually was happening. Like you, I was stunned and in shock. Sheryl - thanks for the comment.